It’s not every day you get to discuss a major work from the aftermath of World War II as if it were brand new. But somehow, it’s taken that long for an English translation of Hans Fallada’s Every Man Dies Alone, and I can’t pass up the chance. It’s been out a long while already, so I must call this one of our Fashionably Late Reviews, but once I turned the last page I knew I had no choice. Hans Fallada was the pen name of one Rudolf Ditzen, a troubled man who once killed his best friend in a failed suicide pact, only to somehow survive, be deemed unfit for trial and imprisoned in a mental institution. He was twice imprisoned, in the days of the Weimar Republic, for embezzlement while working as a clerk. He was a drunk, and an addict; mental illness afflicted him his entire life, and doubtless both contributed to and mitigated the severity of his legal problems. He wrote three novels, but met what writers euphemistically call “modest success” and reasonable people call obscurity and poverty. And one day, Fallada managed to get it right. In 1932, he published Little Man, What Now?, sold forty-eight thousand copies in a year in addition to serializations in periodicals, a film in Germany, a stage version in Denmark and translation rights for numerous languages, which led it to becoming an international hit, including in the United States. Of course, we know what happened in 1933. But Fallada stayed, and suffered through a stormy relationship with the Nazi government, had his works denounced even while trying hard not to give offense, even going so far as to complete a novel of which the Nazis would approve, Iron Gustav, after Joseph Goebbels reportedly said that if Hans Fallada still didn’t know what he thought of the Nazi Party, then the Nazi Party certainly would know what it thought of Hans Fallada. Ultimately cooperation did Fallada no good, and late in 1944 he ended up incarcerated in an asylum, where he completed, in a deliberately convoluted and nearly illegible manuscript, The Drinker, a frank and heartbreaking portrayal of alcoholism in a country where writing about alcoholism could land the author in a concentration camp. After the war, Fallada decided to write about the futile resistance of ordinary Germans against the regime, and settled on the case of Elise and Otto Hampel, who dropped handwritten cards bearing anti-Nazi messages in public places, hoping to spread dissent; instead, they almost all ended up in the hands of the Gestapo, and the Hampels were ultimately found and executed. Inspired, Fallada wrote Every Man Dies Alone in a dizzying twenty-four days, and soon after died before its publication. 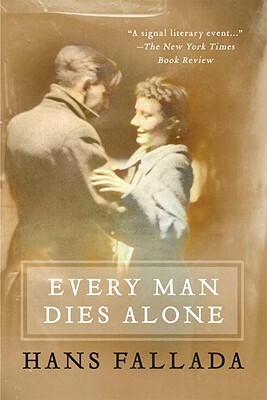 Every Man Dies Alone is not meant to be an uplifting book. (It says so right on the label, doesn’t it?) But, reflecting the fevered pace at which its author worked, it’s a surprising page-turner, written in an accessible, conversational style. It’s an important book, but not an Important Book that bullies the reader with blatant self-regard. Its doomed protagonists, Anna and Otto Quangel are fully human, not Great Souls but ordinary little mice, a grieving couple who lost their soldier son early in the war and were moved to fight back in their quiet, ineffectual way. Fallada takes the reader into the heads of numerous characters, not just the Quangels but the surprisingly thoughtful Gestapo man chasing them and a variety of dissidents and lowlifes, informers and bystanders, laying bare the motivations of each one of them. It’s as suspenseful as any thriller, and as moving as any great romance. It is a chronicle of wickedness both great and petty, and of hopeless, useless defiance. Knowing how it was written, it’s hard not to see Every Man Dies Alone as the last fevered burst of a great literary mind which must have sensed the last grains in its hourglass running out. Though its protagonists’ fates seem inevitable even before the book starts – again, look at the title – the tension seems heightened rather than lessened. It’s a challenging book, not in the sense that it is difficult but in that you, the reader, wonder what you might have done in similar circumstances. Would you have gone along to get along, or sold out a neighbor, or risked your life to speak out against evil? Would you fall short? And if you did, could anyone really blame you for it? Read Every Man Dies Alone. It’s a somber book, and an honest one; it is not just a novel but a message from another time, and a portrayal truer than history.